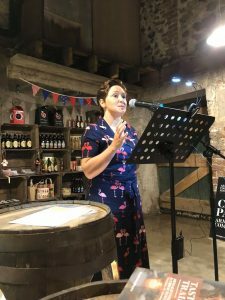 The Armagh Cider Company proved to be excellent hosts as we kicked off the Armagh Food and Cider Festival 2018 with our flash fiction event. 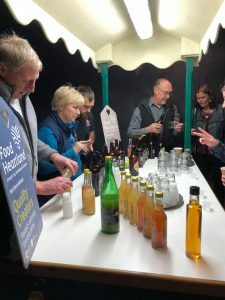 People seemed to arrive more on time than usual, possibly the lure of warm mulled cider on a wet evening, or more likely – as was our case- afraid of getting lost in the wilderness of the Armagh Orchards. 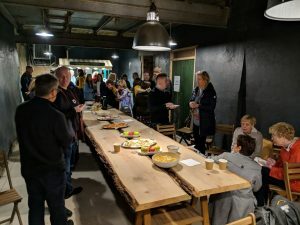 The Barn was welcoming with its rustic decor and its aroma of cider and spices filling the air. Before too long the place filled up. I was heartened to see people who had been before greeting other regulars. Setting out on this project back at the beginning of the year, our goal had been to create community amongst writers and readers and I could see that unfolding effortlessly before me. We started with Elaine Toal and her heartwarming story called Hurricane Glamping. The title drew a wry chuckle from the audience considering Storm Ali had battered us all the previous day. We didn’t need to stretch our imaginations too far back to feel the gusts of wind that Elaine described so eloquently. A minor technical hitch with the sound about a third of the way through Elaine’s reading meant that parts of it were difficult to hear. She battled on professionally to the end, trying to ignore it when the misbehaving mics crackled and fizzed. (The joys of new venues and new equipment!) 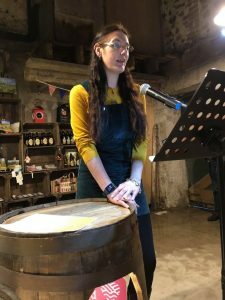 We got the tech sorted and were able to continue, but I was happy when at the break a member of the audience suggested we ask her to read again. They had liked what they had heard and wanted the full story, others agreed and I was struck by the generosity of our audience. 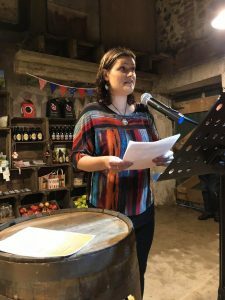 It was also a huge compliment to Elaine who, unencumbered by mics throwing hissy-fits, rocked the story the second time around. Next up was Jay Faulkner, bringing the audience to the brink of tears with his emotive story And Then She Danced. Jay always delivers and the crowd was dead silent as he read. Somewhere outside a baby lamb bleated. 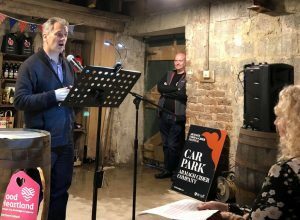 I’m not sure yet if the sound came out on the recording but it was surreal – I wondered if I was imagining it, or if it was someone’s ringtone, but later others confirmed they too had heard a lamb. 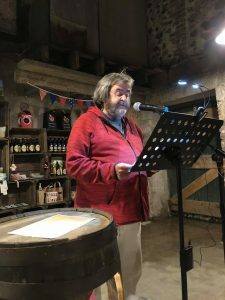 It all added to being in a barn, in an Orchard, in Armagh, telling stories. I had one of those moments? How did I get to be here doing this? And grateful for every second of it, for every person in that barn, readers (listeners) and writers, for one was nothing without the other. My biology head kicked in and labelled it – Symbiosis. 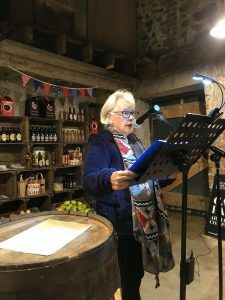 Sue Divin lightened the mood with her lovely and lively rendition of Twist or Pull, a story aptly set in an orchard in Armagh about two young boys stealing apples. The percussion of rain on the tin roof above us added to our sense of being right there in the orchard with them. The twist, as promised in the title was beautifully executed by this excellent wordsmith. Jude Alexander had us all enthralled with her story Realization. Her observation skills and attention to detail reminded me that that is what makes good writing, great. If one can be a better writer by osmosis (or listening to good writing) then I was in the right place! Réamonn Ó Ciaráin’s story Glacadh arm agus an chéad mharú magically transported us, not only to the era of Cúchulainn but in the lyrical Irish language to a story about our Ulster Hero in an anger frenzy being calmed down by way of distraction by the women of Armagh stripping naked – I just hoped they weren’t having the weather we’d been having. 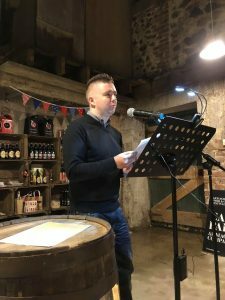 Yet again, it was great to hear people’s positive reactions to hearing the reading in Irish. I continue to be inspired to learn more Irish. During the intermission Philip and Helen Troughton, acclaimed artisan cider makers treated us to a taste of their apple juices and ciders. Delish! 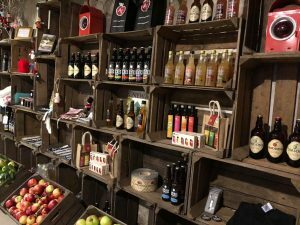 But don’t take my word for it – keep an eye out for their cider range in Tescos, Marks & Spencers and Kellys in Armagh. Go on, treat yourself. Thank you to Mervyn Steenson of Groucho’s in Richhill for providing tasty platters of locally produced snacks. Our first reader scheduled after the break created a spellbinding atmosphere with her reading that even silenced the lamb. A true literary genius, Cathy Carson held our hearts in her hands as she read Ready, leaving hardly a dry eye in the house. Hot on her heels, Paul Anthony pulled us into the world of a person obsessed with counting with his clever use of language in The Dead Counter. The twist at the end collected a unified gasp from the audience and the lamb resumed operations! 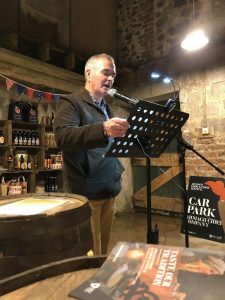 The rain continued to ‘fall like pebbles’ on the roof – to paraphrase John O Connor’s words – as Eddie McClenaghan took to the apple-barrel-podium. He expertly wove a tale in his story, A Smile that carried the audience all the way through a fantastical twist that left us reeling. A new talent we hope to see more of. Kieran Mc Gurk evoked emotion and wry smiles with his story Lonely Hearts. He deftly captured our emotions and served them up to us with added spice and a twist of humour. To round up the evening fellow Women Aloud NI member, Doreen Mc Bride read My Dolls Funeral, leaving us all with a good laugh. When I complimented her on her humour, she looked me straight in the eye and declared that it wasn’t funny at all. She had buried her doll! I’ve heard Doreen read at Women Aloud NI events, and the lady always leaves me smiling. 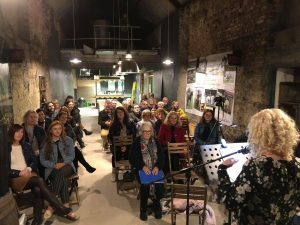 Our next Flash Fiction event takes place during the Georgian Festival in Armagh. 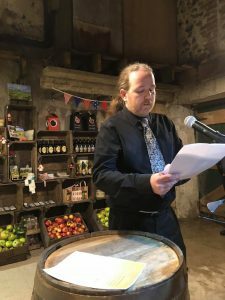 Submissions are open for Flash Fiction in Georgian Armagh until 22nd October. Please do not submit if you are not available to read at the event. 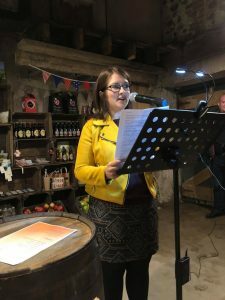 For dates of our other Flash Fiction events until March 2019 click here. We’d like to thank the Armagh City, Banbridge and Craigavon (ABC) Borough Council for their support and for including us in their festivals. I’ve seen the work and commitment that goes into making these festivals so sucessful. They should be really proud of what they have achieved here.